The Adidas Jabulani is the official match ball for the FIFA World Cup 2010 South Africa. The ball was unveiled in Cape Town, South Africa on December 4, 2009. Jabulani means "celebrate" in Zulu. 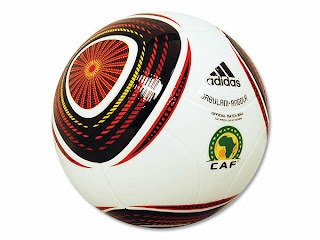 The Adidas Jabulani was also used as the match ball of 2009 FIFA Club World Cup in the United Arab Emirates, and a special version of the ball, the Jabulani Angola, was the match ball of the 2010 African Cup of Nations. This ball is also used in the 2010 Clausura Tournament of Argentina as well as the 2010 MLS season in the USA in the league's colours of blue and green. The world cup 2010 ball is constructed using a new design, consisting of eight (down from 14 in the last World Cup) thermally-bonded, three-dimensional panels. These are spherically-moulded from ethylene-vinyl acetate (EVA) and thermoplastic polyurethanes (TPU). The surface of the ball is textured with grooves, a technology developed by Adidas called GripnGroove that is intended to improve the ball's aerodynamics. The design has received considerable academic input, being developed in partnership with researchers from Loughborough University, United Kingdom. The 2010 FIFA world cup ball has four triangular design elements on a white background. 11 different colours are used, representing the 11 players in a football team and the 11 official languages of South Africa. The Jabulani Angola, used at the 2010 African Cup of Nations in Angola, is coloured to represent the yellow, red, and black of the host nation's flag. The balls are made in Indonesia, using latex bladder from India, thermoplastic polyurethane-elastomer from Taiwan, ethylene vinyl acetate, isotropic polyester/cotton fabric, glue and ink from China.